Printing professionals, designers, and marketing specialists all turn to the best name brands when they need to achieve a polished finish. 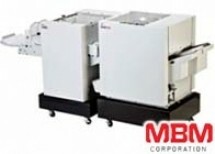 MBM® Corporation produces world-class finishing equipment for the graphics and printing industries from their headquarters in Charleston, South Carolina. Innovation, research, and development are all at the heart of every product they create. 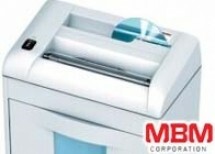 Binding101.com is one of the few equipment dealers who is authorized to sell MBM® Corporation office equipment, and our selection includes some of their most popular cutters, shredders, binding machines, and collators. Shop from our selection today and enjoy free shipping when you spend over $75. If your business needs a fast, durable, and accurate solution for paper finishing and destroying, you have come to the right place. 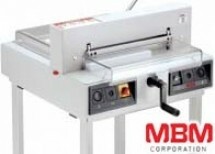 MBM® Corporation’s paper cutters are known throughout the world for their ease of use and pinpoint accuracy. Each machine is designed with unparalleled safety features, so the user can operate with total peace of mind. Our current selection includes their renowned rotary cutters, stack cutters, and much more. Rotary cutters range from 13 inches to 29.5 inches, but each model comes with hardened steel blades and ergonomic cutting heads for safe operation. 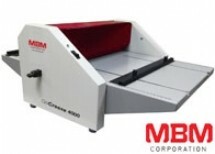 Destroyit® shredding machines by MBM® provide complete shredding solutions for businesses, schools, and home offices alike. Our selection offers a wide range of professional grade shredders with high-security features to smaller deskside models, but every model has the capability to revolutionize your shredding processes. Sort by price, use, capacity, and cut type to determine which model may be the best solution for you and your business. 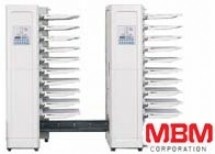 In addition to advanced MBM® Corporation office equipment, we also offer an assortment of binding machines and collators. Simple saddle stitching is easier than ever before with a high-quality binding machine. We offer both single-head and double-head models, so you gain the convenience of simultaneous two-head stitching. Looking for a semi-automatic solution to streamline your book making process? Look no further than our variety of booklet making machines, which can process between 1,500 and 2,3000 booklets per hour without the need of reloading staples. Every cutter, shredder, binder, and collator in our inventory qualifies for our price match guarantee. We will gladly match any lower advertised price on an in-stock item in our inventory. While shopping, remember to sign up for exclusive email offers so you can keep up with new releases, featured products, and much more. If you have any questions, please contact one of our customer service representatives today for further assistance.